For a while now, I've been wanting to host a link-up party. But, since my blog isn't one specific genre, I had trouble deciding what kind of theme I could consistently write about. Then, I took a look at my blog content and noticed a pretty big trend. I adore the simple. I like to write and post unfussy recipes, diy projects, and stories. I want to encourage all of you to enjoy the simple things in the life--to embrace and look for them. Out of this thought, the idea for the link-up party started to form. I want this weekly link-up to be a place to share your simple recipes, projects, stories, gift ideas, photos, etc. Not only do I want it to be a place to share your ideas, projects, thoughts (etc), but to find them. Each week, the link-up will include a post, links to some of my favorites from the past week (you could be featured! ), and even photos that capture simplicity. 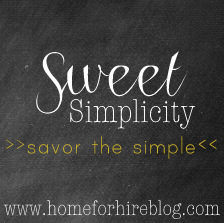 If you have Instagram, I'd love for you to share simplicity with the hashtag: #savorthesimple. I'd love to start collecting these photos and featuring them in the weekly post. The weekly party will be on Tuesdays, so get your posts (old or new!) ready for January 15th. I really want this party to include lots of variety, so feel free to think outside of the box! For example, I'd love to see ideas about easy blog/house design tips, outfit ideas, unfussy activities for children, simple cleaning tips, etc. In any case, I'm excited for this new little blogging adventure and hope that many of you join me or come and visit on Tuesdays for inspiration!